A laboratory buried nearly a mile beneath South Dakota is at the forefront of a global push for subterranean science. The elevator that lowers them 4,850 feet down a mine shaft to a subterranean physics lab isn’t called an elevator, the physicists tell me. It’s called The Cage. It descends at precisely 7:30 A.M.—the same time it leaves the surface every day—and doesn’t wait around for stragglers. I show up on time, and prepare to board with a group of scientists. We look identical: in coveralls blinged out with reflective tape, steel-toed boots, an emergency breathing mask and a lamp that clips to the belt and loops over the shoulder. An operator opens the big yellow door, directs us inside and then closes The Cage. Soon it begins bumping down at 500 feet per minute. The operator’s headlamp provides the only light, tracing along the timber that lines the shaft. We descend for 10 minutes, silently imagining the weight of the world above us increasing. Water trickling down the shaft’s walls provides an unsettling sound track. This place—the Sanford Underground Research Facility (SURF) in Lead, S.D.—hosts experiments that can only be conducted deep under Earth’s surface. Entombed beneath the Black Hills by thousands of feet of solid rock, these experiments are shielded from much of the background radiation that bathes the planet’s surface. Here scientists can more easily detect various elusive cosmic messengers that would otherwise be swamped by the sound and fury at the surface—neutrinos that stream from our sun and from distant exploding stars or other hypothetical particles thought to make up the mysterious dark matter that acts as a hidden hand guiding the growth of galaxies. Such particles are so dim that they’re drowned out aboveground: Looking for them there is a bit like looking for a spotlight shining from the sun’s surface. But these are the very particles scientists must study to understand how our universe came to be. And so, from the depths of Earth where even the very closest star does not shine, they are glimpsing some of the most ancient, distant and cataclysmic aspects of the cosmos. This place was not always science-centric: For more than 100 years its labyrinth of deep chambers and drippy, dirt-floored tunnels was a gold mine called Homestake. 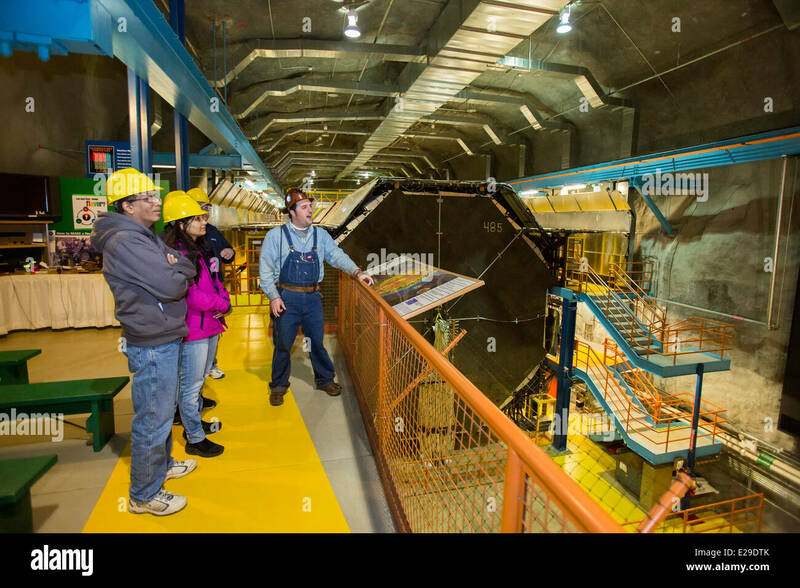 Today, stripped of much of its precious ore, the facility has become a figurative gold mine for researchers as the U.S.’s premier subterranean lab. This fall SURF will debut a new experiment at the frontiers of physics: CASPAR, which mimics the conditions at the cores of stars where atoms of hydrogen and other light elements fuse to release energy, forming as a by-product the more substantial elements required for building asteroids, planets, mines and mammals. This year physicists are also starting to build equipment for an experiment called LUX–ZEPLIN (LZ), which will try to detect particles of dark matter as soon as 2020. It is all part of a trend unfolding around (as well as within) the globe, as scientists construct or repurpose buried infrastructure in places like Minnesota, Japan, Italy, China and Finland to peer deep into the cosmos from deep underground, seeking to learn why the universe is the way it is—and maybe how humans got here at all. Inside The Cage, the riders have leaned their heads back against the walls, eyes closed for a quiet moment before work. They look up as the elevator lurches to a stop and the door opens onto a rounded, rocky hallway, covered in netting to protect against rock slides and cave-ins. The light is yellow, with a spectrum not unlike the sun’s. “Just another day in paradise,” one of the passengers says as the operator releases us into this alien environment. We walk away from The Cage, our only conduit to the surface, and toward the strange science that—like extreme subterranean organisms that survive without sunlight—can only happen here. (LZ), which will try to detect particles of dark matter as soon as 2020. En route to our first destination, the LZ dark-matter experiment, we walk through a section of the mine called the Davis Lab. Its name descends from late physicist Ray Davis, who visited the town of Lead in the 1960s with a science experiment in mind. Back then Lead and next-door Deadwood looked much like they look now, with one-floor casinos and a bar bearing a sign that reads “Historic Site Saloon No. 10 Where Wild Bill Was Shot.” Davis had asked the owners of the Homestake Mine if he could use a small slice of that vast space to search for solar neutrinos. Neutrinos are nearly massless particles with no electrical charge. They move almost as fast as light itself. They are barely subject to the effects of gravity and are immune to electromagnetism. In fact, they hardly interact with anything at all—a neutrino might just zip straight through the atoms of any corporeal object in the universe in the way a motorcycle can split lanes straight through traffic. Physicists and astronomers love neutrinos because their cosmic shyness keeps them pristine. Each carries imprints, like birthmarks, from the explosions and radioactive decays that unleashed them on the cosmos. By studying them, scientists can learn about the inner workings of supernovae, the first moments after the big bang, and the seething hearts of stars—including our sun, which is what Davis wanted to investigate. In the 1960s, theorists had already predicted that neutrinos should exist, but no one had yet found them in the physical world. The mining company decided to let Davis try to become the first person to do so. Toiling away on Homestake’s “4850 level”—the “floor” 4,850 feet below the surface—Davis built a neutrino detector that became operational in 1967. Over the course of the next quarter century he extracted what he came for: actual neutrinos, not just theoretical ones on paper. As the first person to directly detect the particles—and so prove they existed at all—Davis won the 2002 Nobel Prize. He was one of the first to show that, sometimes, to best connect with deep space, humans have to travel farther from it, deep inside the planet itself. During the initial decades of the Davis experiment, the Homestake Mine continued sending a steady stream of gold to the surface, ultimately producing nearly three million pounds of the precious metal during its lifetime—the most of any mine in the Western Hemisphere. But in 2002 when the price of an ounce dropped too low for the mine to turn a profit, Barrick Gold Corp. shut it down and later donated the facility to the State of South Dakota. The state—with funding from billionaire T. Denny Sanford and the U.S. Department of Energy—expanded on Davis’s legacy and turned the whole operation into a physics lab: today’s SURF, with the original Davis Campus at its core. As we enter the Davis Campus, we snap elastic-ankle booties over our shoes and are gifted a sticker. “It’s always sunny on the 4850,” it says. The evidence does not support this conclusion. Hanhardt walks along the platform toward the high-ceilinged room that SURF employees are currently preparing for LUX-ZEPLIN. Most of the space belongs to an immense and empty water tank—three and a half times as tall as me, and across whose diameter four and a half of me could lie down. Hanhardt calls it the “giant science bucket.” Once it had been filled with 72,000 gallons of water and shielded an experiment called LUX, which operated from October 2014 to May 2016. At the time LUX was the world’s most sensitive seeker of dark matter—more attuned to the universe’s most mysterious particles than any other experiment on the planet. Decades of observations with telescopes have hinted the universe is full of invisible matter that neither emits nor reflects light but outweighs all the visible stars, gas and galaxies combined. This dark matter has apparently shaped some of those galaxies into spirals, and may even be what made their matter glom together into galaxies in the first place. No one knows exactly what the dark matter is made of, but most physicists agree it is likely composed of at least one kind of undiscovered subatomic particle. But just as one cannot say for sure what Sasquatch looks like until you spy one on a remote camera or ensnare one in a trap, scientists can’t say what dark matter is until they capture some. LUX tried to do just that. During its nearly yearlong run, a 350-kilogram canister of liquid xenon sat nested like a matryoshka doll inside the giant water tank, which isolated the xenon from the intrepid background of run-of-the-mill cosmic rays that manage to penetrate even this far underground. The xenon, denser than solid aluminum, waited hopefully for hypothetical dark matter particles to tunnel through thousands of feet of earth, ending up in South Dakota after their interstellar—or even intergalactic—journeys. If a particle of dark matter struck an atom of xenon, the collision would produce a flash of light. Electrons would then spin out of the collision, making a second flash. Detectors lining the tank’s interior would pick those up and send a signal back to scientists, who could rewind the reaction to study the particles that first sparked the fireworks. In October 2016 SURF scientists began dismantling LUX and carting its xenon, like miners, to the surface. The setup had seen nothing. Dark matter had stayed true to its name. To tenacious physicists, that just meant they needed a bigger, better bucket in which to collect dark matter: LUX-ZEPLIN. When it debuts in 2020, this follow-on experiment will still be the best in the world: 70 times as sensitive as its predecessor, thanks in large part to its 10 metric tons of liquid xenon—as compared with LUX the First’s puny third of a metric ton. The scientific collaboration, which involves 250 scientists from the U.S., the U.K., Portugal, Russia and South Korea, launched construction in February. Hanhardt sticks his head inside the silvery cylinder of the empty water tank and whispers “Helloooo.” The tiny sound seems to echo almost endlessly, bouncing on the tank walls and throwing itself back at us as evidence of his existence. SURF occupies one of the world’s deepest scientific spaces, more than twice as far down as the Soudan Underground Laboratory in Minnesota, which is in a former iron mine. The Super-Kamiokande lab, which focuses on neutrinos like Davis did, occupies the Mozumi zinc mine in Japan, 3,300 feet underground. The deepest physics facility in the world, though, is China’s Jinping Lab, in Sichuan, China which takes advantage of the tunnels beneath a hydroelectric dam. 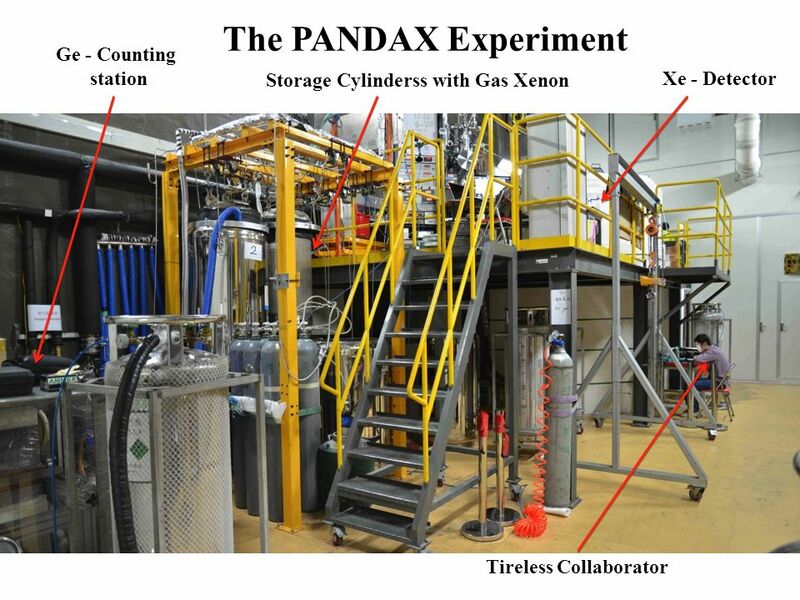 It has a dark matter detector and a neutrino experiment called PandaX. Using existing infrastructure, as these labs do, means scientists can focus on building their experiments instead of blasting rock. And it means they can rely on local workers who already know how to help maintain the snaking caverns that might otherwise flood, collapse or fill with poisonous gases. Italy is the first country to complete a belowground lab, Gran Sasso, for the express purpose of doing research. It took them 30 years. Each of these far-flung facilities is racng to be the first to make breakthrough discoveries about elusive dark matter and ghostly neutrinos. But for the end-result science to emerge at its best, the facilities need one another—and one another’s data—to be better, faster and stronger than they can manage on their own. Together, they form an ecosystem that supports science that can’t be done on the surface. SURF, since its genesis, has been expanding beyond the Davis Campus to other parts of the mine—of which there are plenty. The new “campus” is so far away that to visit it we take a railway cart, rumbling down darkened tracks through cavernous spaces like pickax-wielders of old. Cool air still blows past us, somehow flowing into this nether realm fresh from the surface world almost a mile above. Hallway lights pass at intervals, glowing then receding in slow, strobelike procession until we reach what is called the Ross Campus and the CASPAR experiment. 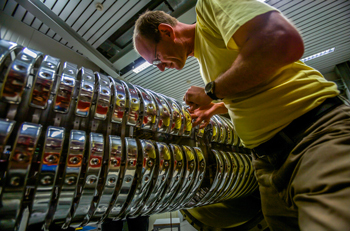 CASPAR is a particle accelerator—but one that fits in a regular-size room. A series of tubes, the air sucked from them by vacuum pumps, snakes across tables that run all the way across the room, then bend back into a farther open space. From one end a beam of particles streams through the tubes, its path bent by magnets. At the other end sits a target. When the beam bull’s-eyes it, the collision triggers the fusion processes that happen inside stars, when small atoms join to build larger ones. These processes happen deep inside stellar cores all across the universe, and have created essentially all the elements heavier than helium (elements astronomers call “metals,” even when they are not down in mines). All those “metals” comprise you, me, these tubes, this cavity, SURF, the ecosystem of underground labs, Earth and everything you may (or may not) care about. But scientists do not actually understand the details of how stars fuse elements. And because they cannot fly into the center of a star, they have instead traveled toward the center of the planet. Here, shielded from stray radiation and particles that bombard Earth’s surface, they can much more clearly see the particles and radiation from their own experiment, rather than from the sun or space. When we arrive, a batch of graduate students and three professors are huddled over several computers, trying to get that beam as just-right as it can be. The mini accelerator itself is on the other side of a door next to them. It looks like a kid’s chemistry set, minus the colorful liquids. Physicist Michael Wiescher, from the University of Notre Dame, steps away from his colleagues to tell me what they are doing. He speaks quietly, perhaps trying not to disturb them. He needn’t worry, though: Their attention is as focused as the experiment’s beam. That’s because it’s a big day down here: Wiescher and the others, from Notre Dame and the South Dakota School of Mines, are just starting to launch the beam toward their target. Soon they will make their own pint-size stars, farther from outer space than most people ever go. Their first experiments will examine the details of a process called “helium burning.” In the burning’s first stage, an important interaction happens when three helium nuclei alchemize into one carbon—the atom that by definition makes molecules “organic.” In actual stars this only happens with age: After stars like the sun have burned through most of the hydrogen fuel at their cores, and have evolved into red giant stars, they begin to fuse helium instead. But here in SURF, in a bathroom-size setup, CASPAR can learn about burning helium any day the scientists see fit, and so learn how to create again and again the elements that became us—fast-forwarding the sun’s clock while rewinding our own. “It’s not just physics,” says Hanhardt, who stands watch as the team works, “It’s philosophy.” It deals, in other words, in the big questions: How, literally, did we get here? Why, cosmically? These queries have scientific answers but existential implications, the science having moved into territory previously only occupied by religion. European researchers, Wiescher tells me, are two years behind in their work on a similar project called LUNA–MV at Gran Sasso. China is building its own—JUNA. But CASPAR will (any day now) start cooking first. After the CASPAR team gets a few results on their own, they plan to merge data with some of these other teams, and will let scientists come down to this cave to do their own experiments with the CASPAR equipment. 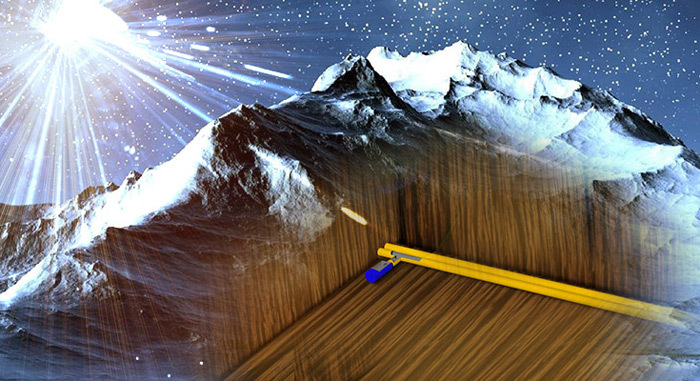 Someday soon—when CASPAR opens up for collaborators, when LZ begins its search—SURF will be robust and bustling in the way of the gold mine’s heyday, back when a single neutrino experiment squatted in a corner. One of the computer-focused scientists says, “We have 100 percent beam transmission!” and then a smiling grad student—Thomas Kadlecek, from the South Dakota School of Mines—turns to me and Wiescher. He likes it down here, he says. His grandfather was a miner back when it was Homestake. With that, he quickly turns away again goes back to his work, leaning on a rack of electronics.